Here is a very basic spreadsheet with details of names and mobile/cellphone numbers. 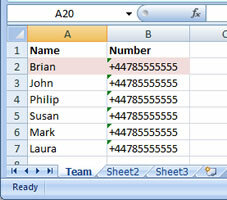 In ExcelSend we simply open the spreadsheet, select the Number field as the destination number and type in our text message. We can then preview all the messages to ensure the merging worked the way we wanted. Finally, we click the Send Messages button and all the messages are sent over the Internet to your Service Provider and instantly onwards to the destination mobile/cellphone handsets. This spreadsheet contains payment information for staff members. 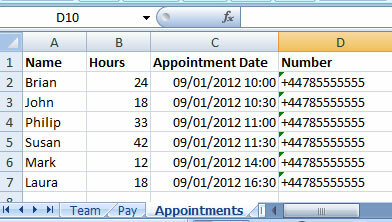 We can merge information from this spreadsheet in to a payslip style message for each employee. We open the spreadsheet from ExcelSend and enter our message with the appropriate merge fields. Hi Brian, you worked 24 hours this week. Your pay of £294.00 will be transferred to your account on November 30th at 10:15. Regards Accounts. Finally, we click the Send Messages button and all the personalised messages are sent separately over the Internet and onwards to the destination mobile/cellphone handsets. In this example we have a spreadsheet with contact details and appointment times and we want to schedule text reminders to go 1 hour before each appointment. We enter the text message as normal using format modifiers to show the time portion of the spreadsheet’s datetime field. In this example we want each message to go at a different time so we tell ExcelSend to retrieve the send time from the spreadsheet itself. Here we use the appointment time and then modify the send date by 60 minutes. Therefore each message will be scheduled to be sent 1 hour before the appointment time. In the messages preview you can see both the message and the estimated message delivery time. Take a look at our buying guide, chat with us online or try out the software for free.